Now if you saw a bird or watched a bird go on it's side then upside down as in feet in the air and laying on it's back, you might think, Oh it died! Well that's exactly what we thought when having a picnic lunch by the water near the first caravan park we stayed in in Bowen and saw this bird. The photos were taken with my phone so not the best quality. The bird in question - sorry that the image is not sharp but it's the phone. The above bird don't know it's name either, there is a also a blue one. They do. There were many that landed on the table whilst we ate. Hi Margaret: Your birds in sequence are Australian Magpie, Blue-faced Honeyeater and Silver Gull. The honeyeater is probably a juvenile, not having attained the facial blue of an adult. Hope this helps! I am at a loss to explain the strange behaviour of the magpie. Thank you David, I knew you would know what birds they were. 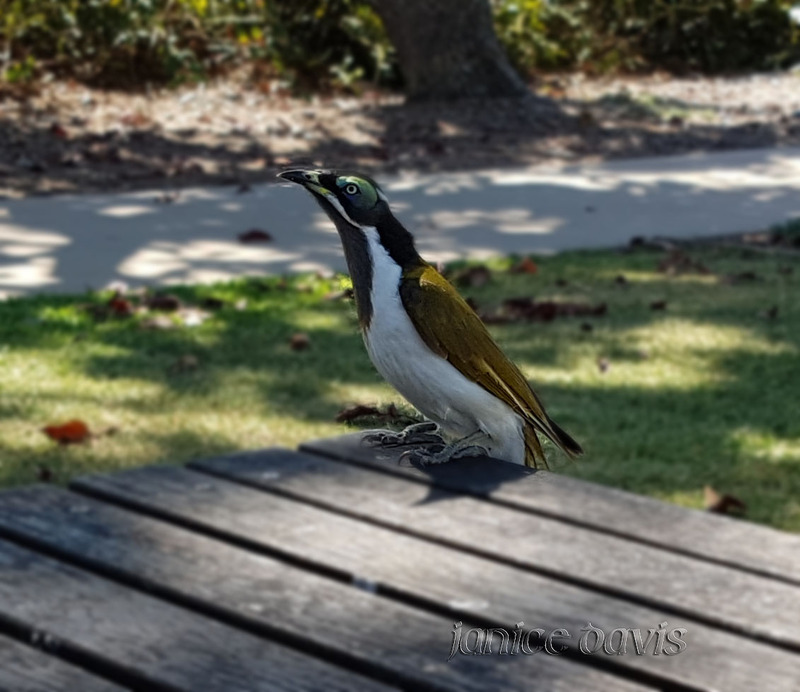 The Honeyeater was very pretty and there was one bird with blue and one with green for each one, so pairs. Was rather strange to see the magpie to his/her 'act' and even more amazing to see it get up and fly off. Very different to what I've seen before. 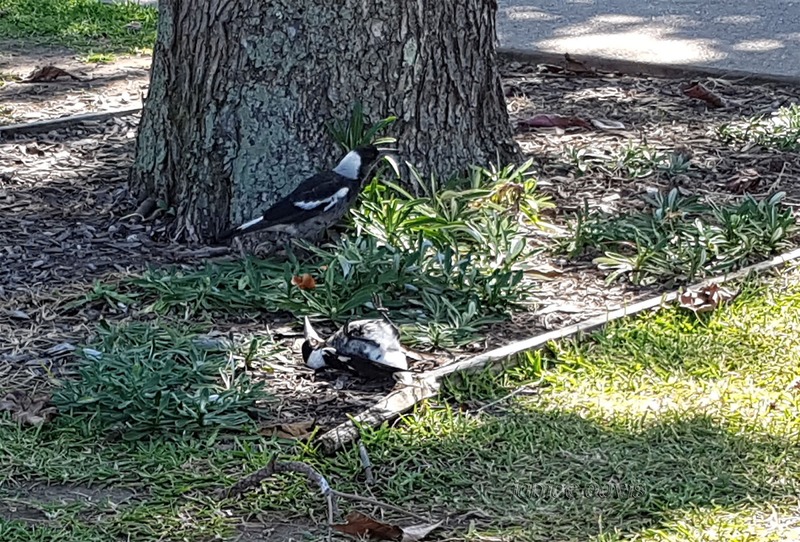 Maybe the magpie is doing what dogs do when playing and indicated they are submissive to another dog. I would have thought it was dead. Could be Andrew, I guess we might never know why the magpie did that. I have seen magpies do that. And hop up perfectly healthy a few minutes later. Which I hope yours did. Yes he did fly off into the afternoon. Can't say I have seen magpies do that. How interesting!! Nature is interesting and haven't seen it before of heard of it. How strange. You must have been quite surprised to see the magpie stand up again. The honey eater is very striking in his color and pose. You have such interesting birds in Australia! 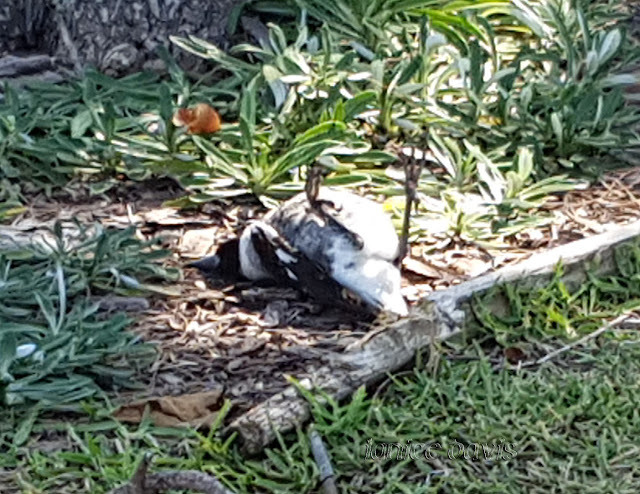 Well that magpie just got down as a dog would and it was hard to believe ones eyes at the time, we really thought it was dead, but no, up he rose and flew off! Magpies do that quite often. Showing off I put it down to. Pee-wees are also good at this stunt. Maybe they just put on a circus like act for you - ha ha! This one was sure showing him or herself off for sure, looked rather odd and it was amazing to witness such and act. So he was pretending? Maybe hoping you'd put down some water or crumbs for him. 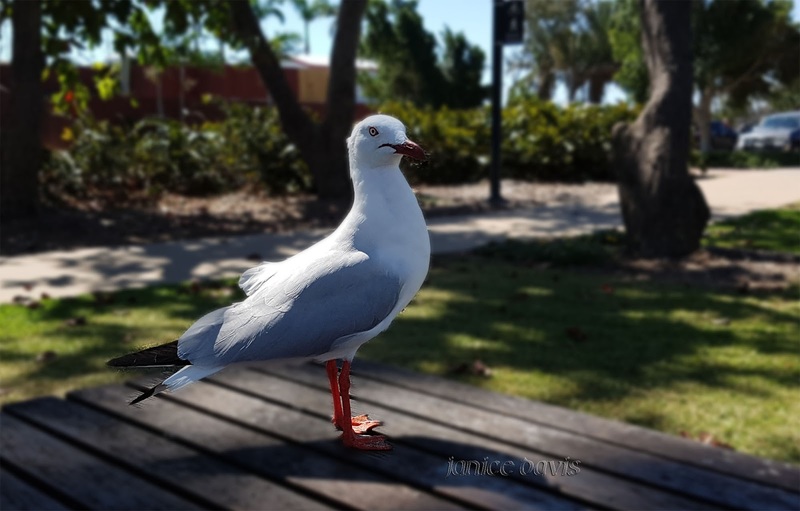 I've heard of birds getting sympathy pretending to be lame by holding up one leg, then when you throw food they lower the leg and run for it. Very interesting! Magpies are clever birds, but no idea why he was doing that. 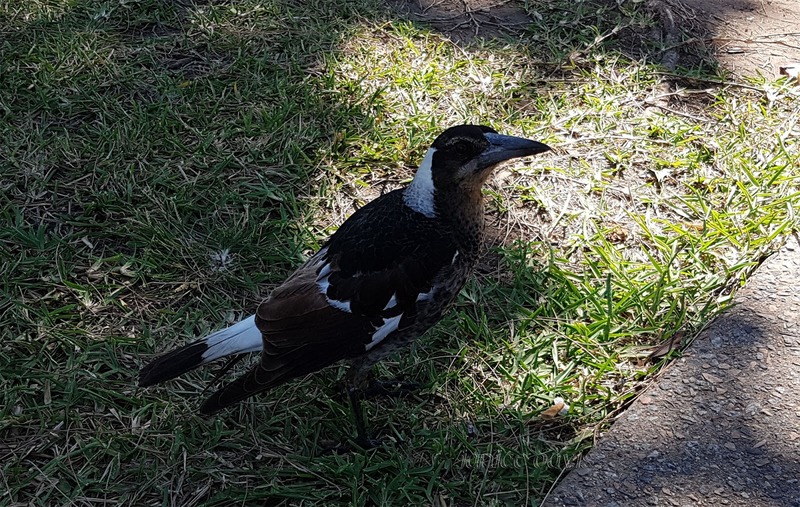 The Australian Magpie is the first one and the second Blue-faced Honeyeater and Silver Gull. Beautiful Honeyeater is my favourite. Por lo menos, ya que nos llevabas la cámara, las has podido capturar mediante la cámara del teléfono. Usually I take my camera with when travelling but left it behind but the phone came in handy - I'm sure in the future the phone cameras will be much better quality. 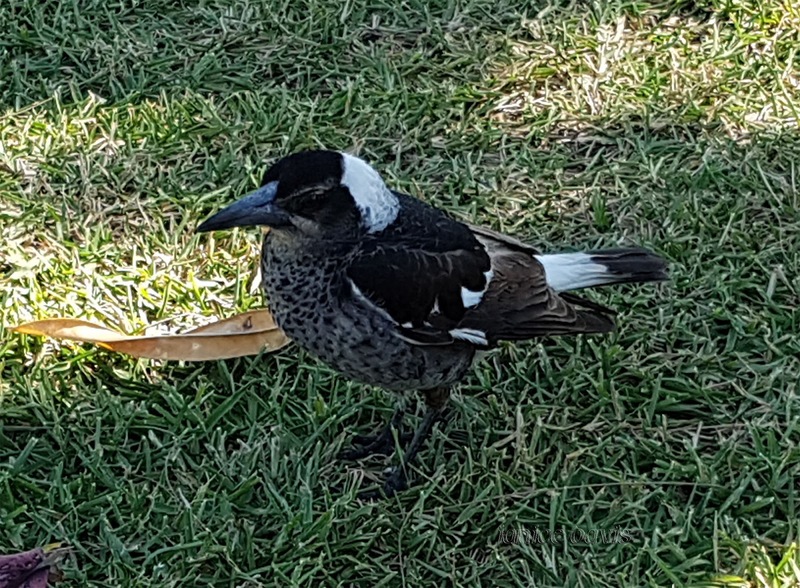 I thought that first one resembled a magpie. Super good pictures! Thank Bill. Hopefully phone cameras will improve in the future but of course many of us will still used our cameras. "Dust baths, also called dusting or sand bathing, are part of a bird’s preening and plumage maintenance that keeps feathers in top condition. The dust that is worked into the bird’s feathers will absorb excess oil to help keep the feathers from becoming greasy or matted. The oil-soaked dust is then shed easily to keep the plumage clean and flexible for more aerodynamic flight and efficient insulation. Dry skin and other debris can also be removed with excess dust, and regular dusting may help smother or minimize lice, feather mites and other parasites." I love the Bowen area...the beaches are spectacular...and it's a nice little town, too. I managed a resort there, briefly, once...at Horseshoe Bay...long story...short tenure. I wrote a post about it once. The then owners were "shonks"! And, unfortunately, my late brother and I were their "patsies". Thanks for the information re bird on back. It makes sense now. funny pose of that beautiful bird Margaret! thank you for sharing these beauties of you part of land i would love to know about more birds of your area my friend! Was rather strange to see that bird do that.